Sometimes you get a good look in the mirror, and it’s not pretty. I’m not talking about the gray-hair, eyelids-drooping-over-my-lashes, not-another-chin-hair kind of look. I’m talking about getting a real good look at what is overflowing on the inside and now spilling to the outside. That happened with me the other day. Ugh. It was not pretty. Over the past two years, I’ve found myself in a whirlwind of death, tragedy, and grief. We’ve lost Dad, Grandma, Aunt Sherri, Aunt Carol, Uncle Buzz and Aunt Marg. And those are just the deaths. We’re still losing Mom to Alzheimer’s and Parkinson’s cruelly co-existing within her. And the others…well, I can’t even talk about them right now. Everything is flying out of control. 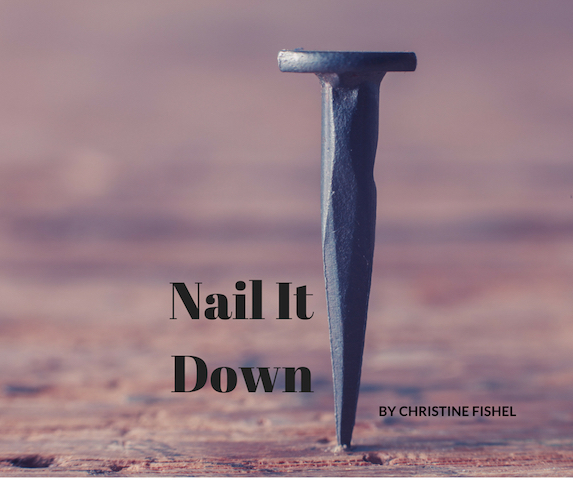 I’ve done what has come natural and what has been taught to me: I nail down anything I can. I gather facts. I organize them neatly into concise bullet points. I schedule everything I can think of, drawing neat lines through them as they are completed. The ugly part? I’ve stepped on toes, created misunderstandings, and offended others with my charging ahead, my blunt words, and my task-oriented focus. At Grandma’s funeral, my brother offered to get a cup of coffee for Mom. “I’ll go with you,” I said and immediately jumped up and followed him to the small room in the basement. I proceeded to pour the cup of coffee myself, handing it to him to deliver. I could see it irritated him, but I didn’t understand why. I was just trying to help. On several occasions, I’ve charged ahead to fill the leader role when no one else immediately stepped in to take it. Why would that be offensive? It’s not like I wanted to do the job. I believed I was simply the only one available or willing to do it. Taking a deeper painful look at myself, I see now that it isn’t really helpfulness underneath these actions. Fear of sitting in the silence of grief. What might bubble to the surface in the silence? Fear of letting the feelings overwhelm and take over. What if I begin to cry and cannot stop the sobbing? What if I break and cannot be put back together? And so I have worked myself to exhaustion, nailing down anything I can, as more people I love leave me though the various tragic ways they do. But now this comes to me: The nailing has already been done. And then this: There is forgiveness because of the nailing He endured. There is no going back, no taking away what has been said, what was done. But there is something more powerful than a redo. It is the forgiveness and acceptance and comfort and peace that cannot be given by humans, but, because of Jesus, is given to me. To me?! Yes, to me. And not because I’ve earned it or deserved it. Simply because that’s what love is. That’s who Jesus is. I still cannot fathom it. I still want to grab the hammer and nail down the small things in my life. But I am at least–finally–understanding that my nailing has no meaning. That work has already been done, and I need to only hold out my own hands and accept it.